Do あなた think Sakura gets so much unfairly hate? Do あなた prefer long haired Sakura, または short haired Sakura? Doesn't Sakura remind あなた of Trixie Tang from the Fairly odparents によって rejecting NARUTO -ナルト- indeed ? do あなた Sakura ファン know why some people hate Sakura? Was. She IS not weak anymore. Tsunade trained her! That woman was known to punching the earth into nothing! And annoying? Just because she was もっと見る emotional than most ninjas doesn't mean she's annoying. 移動する on people! It was back in part one when she doesn't have good character development. Excuse me! She only does that when NARUTO -ナルト- does something stupid that he needed reprimanding! "Come in" 発言しました Tsunade when the door open, Sakura came in. "Is there something あなた need?" 発言しました Sakura looking at Tsunade, but Tsunade had a sad face as Sakura confusion. "Sakura, I decide to give あなた a mission but あなた are not going back here Konoha." 発言しました Tsunade with a sad as Sakura shock, she not coming back here? Why? NARUTO -ナルト- met Sakura at the party. He have seen her before. Sakura is a medic, she is smart and beautiful.She was so outstanding, many guys are chasing after her, while he was a normal guy and people would only paid attention because he is different. I'm not supposed to 愛 you, I'm not supposed to care, I'm not supposed to live my life wishing あなた were there. I'm not supposed to wonder where あなた are and what あなた do. I'm sorry, i can't help it, I'm so in 愛 with you. I'm sitting at my desk, drawing a picture of お花 while waiting for the teacher. Before long, Miss Kurenai walks into the classroom. "Good morning class, today we have 2 new students from the Hyuga clan, Hyuga Neji and Hyuga Hinata." A scowling boy with flowing dark hair and a cute girl with dark blue hair plus an anxious look on her face step into the class. Everyone starts whispering excitedly. Neji catches my eye, and finally, smiles. It was the start of a beautiful friendship. Oh NARUTO -ナルト- never before have I seen あなた like this. Never before in such a way. Never before so full of hate,...the hate.... now over flowing incasing your body, oh Naruto. I hear a monsterous scream leave your mouth is it you, is it あなた naruto? あなた sound, あなた look as if あなた are in pain. I fill with rage, how dare the white haired boy call あなた a monster..you are not. How dare he call あなた pathetic.I whant to hurt him, I want to blame him, I hear あなた scream onece more, and I know, I can not blame anybody but myself. Naruto, his フレンズ and enemies are all standing in front of the very very big mansion. Naruto, his フレンズ and enemies walked inside the mansion. Sakura learns through pain what true 愛 is, but to forget is as difficult as to make the right. What is her final choice? a pop quiz question 追加されました: According to character trivia from Boruto, her attributes is numbered as what for dexterity? (Whoever got this picture rocks and thanks to whoever created it) What episode does this happen? 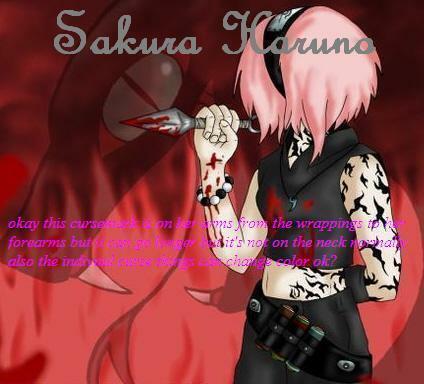 Do あなた think Sakura will die?? What type of elemental chakra do あなた think Sakura has?